The Northrop P-61 Black Widow was the first operational U.S. military aircraft designed specifically to use radar. The "Black Widow" was an all-metal, twin-engine, twin-boom, aircraft flown as a night-fighter by United States Army Air Forces squadrons in the European Theater, the Pacific Theater, the CBI Theater, and the Mediterranean Theater during World War II. It replaced earlier British-designed night-fighter aircraft that had been updated to incorporate radar when it became available. On the night of 14 August 1945, a P-61B-2 of the 548th NFS named "Lady in the Dark" was unofficially credited with the last allied air victory before VJ Day. The P-61 was also modified to create the F-15 Reporter, the last piston-powered photo-reconnaissance aircraft designed and produced for the U.S. Air Force. In August 1940, a full 16 months before the United States entered the war, the U.S. Air Officer in London, Lieutenant General Delos C. Emmons, was briefed on British research in RADAR (Radio Aids to Detection and Ranging), which had been underway since 1936 and had played an important role in the nation's defense against the Luftwaffe during the Battle of Britain. General Emmons was informed of the new Airborne Intercept radar (AI for short), a self-contained unit that could be installed in an aircraft and allow it to operate independently of ground stations. In September 1940, the Tizard Mission traded British research on many aspects including radar for American production. Picture - The P-61's upper turret is visible on the fuselage between the wings. General Emmons returned to the U.S. with details of the British night-fighter requirements, and in his report said that US aircraft design bureaus possibly could produce such an aircraft. The Emmons Board developed basic requirements and specifications, handing them over towards the end of 1940 to Air Technical Service Command, Wright Field. After considering the two biggest challenges—the high weight of the AI radar and the very long (by fighter standards) loiter time of eight hours minimum—the board, like Jack Northrop, realized the aircraft would need the considerable power and resulting size of twin engines, and recommended such parameters. Vladimir H. Pavlecka, Northrop Chief of Research, was present on unrelated business at Wright Field. On 21 October 1940, Colonel Laurence Craigie of the ATSC phoned Pavlecka, explaining the USAAC's specifications, but told him to "not take any notes, 'Just try and keep this in your memory!' " What Pavlecka did not learn was radar's part in the aircraft; Craigie described the then super-secret radar as a "device which would locate enemy aircraft in the dark" and which had the capability to "see and distinguish other airplanes." The mission, Craigie explained, was "the interception and destruction of hostile aircraft in flight during periods of darkness or under conditions of poor visibility." On 5 November, Northrop and Pavlecka met at Wright Field with Air Material Command officers and presented them with Northrop’s preliminary design. Douglas’ XA-26A night fighter proposal was the only competition, but Northrop’s design was selected and the Black Widow was conceived. Following the USAAC acceptance, Northrop began comprehensive design work on the aircraft to become the first to design a dedicated night fighter. The result was the largest and one of the most deadly pursuit-class aircraft flown by the U.S. during the war. Jack Northrop's first proposal was a long fuselage gondola between two engine nacelles and tail booms. Engines were Pratt & Whitney R-2800-10 Double Wasp 18-cylinder radials, producing 2,000 hp (1,491 kW) each. The fuselage housed the three-man crew, the radar, and two four-gun turrets. The .50 in (12.7 mm) M2 Browning machine guns were fitted with 36 in (91 cm) long "aircraft" barrels with perforated sleeves. The turrets were located in the nose and rear of the fuselage. It stood on tricycle landing gear and featured full-span retractable flaps, or "Zap flaps" (named after Northrop engineer Edward Zap) in the wings. The aircraft was huge, as Northrop had anticipated. While far heavier and larger multi-engine bombers existed, its 45.5 ft (14 m) length, 66 ft (20 m) wingspan and projected 22,600 lb (10,251 kg) full-load weight were unheard of for a fighter, making the P-61 hard for many to accept as a feasible combat aircraft. Late in November 1940, Jack Northrop returned to the crew of three and twin tail/rudder assembly. To meet USAAC's request for more firepower, designers abandoned the ventral turret and mounted four 20 mm (.79 in) Hispano M2 cannons in the wings. As the design evolved, the cannons were subsequently repositioned in the belly of the aircraft. The P-61 therefore became one of the few U.S.-designed fighter aircraft to have 20 mm (.79 in) cannons as factory-standard in World War II. Others were the P-38 Lightning, the F4U-1C (a limited-production Corsair sub-variant), and the A-36 Apache dive-bomber (an early form of the P-51 Mustang). While some F6F Hellcats and repossessed British lend-lease P-39 Airacobras (renamed P-400) were also fitted with 20 mm (.79 in) cannons, it was not standard practice. Northrop Specification 8A was formally submitted to Army Air Material Command at Wright Field, on 5 December 1940. Following a few small changes, Northrop's NS-8A fulfilled all USAAC requirements, and the Air Corps issued Northrop a Letter of Authority For Purchase on 17 December. A contract for two prototypes and two scale models to be used for wind tunnel testing, (costs not to exceed $1,367,000), was awarded on 10 January 1941. Northrop Specification 8A became, by designation of the War Department, the XP-61. The Air Corps Mockup Board met at Northrop on 2 April 1941, to inspect the XP-61 mock-up. They recommended several changes following this review. Most prominently, the four 20 mm (.79 in) M2 cannons were relocated from the outer wings to the belly of the aircraft, clustered tightly just behind the rear of the nose gear well. The closely spaced, centered installation, with two cannons stacked vertically, slightly outboard of the aircraft's centerline on each side, and the top cannon in each pair only a few inches farther outboard, eliminated the inherent drawbacks of convergence. Convergence was a necessity in wing-mounted guns. Convergence is the specific point or points of range and elevation at which arming crews calibrate the weapons' projectile paths to intersect the aircraft's centerline, preventing a "safe zone" in front of the aircraft through which no projectiles would pass if wing guns were set to fire straight ahead. Projectiles fired at a target beyond the point of convergence crisscross before reaching the target and miss wide; projectiles fired at a target closer than the point of convergence either pass on either side or fail to impact at a concentrated point, minimizing the damage inflicted. In practice, both cases limit the cannons' effective ranges to a very small zone on either side of a set distance, and create additional challenges when calculating deflection ("pulling lead") for a moving target. Without convergence, aiming was considerably easier and faster, and the tightly grouped cannons created a thick stream of 20 mm (.79 in) projectiles. The removal of the guns and ammunition from the wings also cleaned up the wings' airfoil and increased internal fuel capacity from 540 gal (2,044 l) to 646 gal (2,445 l). Other changes included the provision for external fuel carriage in drop tanks, flame arrestors/dampers on engine exhausts, and redistribution of some radio equipment. While all beneficial from a performance standpoint — especially the movement of the cannons — the modifications required over a month of redesign work, and the XP-61 was already behind schedule. In mid-1941, the dorsal turret mount finally proved too difficult to install in the aircraft, and was changed from the General Electric ring mount to a pedestal mount like that used for the upper turrets in B-17s, B-24s, B-25s, A-20s and other bombers. Following this modification, the turret itself became unavailable, as operational aircraft, in this case the B-29, were ahead of experimental aircraft in line for the high-demand component. For flight testing, engineers used a dummy turret. 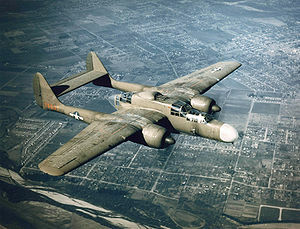 The P-61C was a high-performance variant designed to rectify some of the combat deficiencies encountered with the A and B variants. Work on the P-61C proceeded quite slowly at Northrop because of the higher priority of the XB-35 flying wing project. In fact, much of the work on the P-61C was farmed out to Goodyear, which had been a subcontractor for production of Black Widow components. It was not until early 1945 that the first production P-61C-1-NO rolled off the production lines. As promised, the performance was substantially improved in spite of a 2,000 lb (907 kg) increase in empty weight. Maximum speed was 430 mph (690 km/h) at 30,000 ft (9,000 m), service ceiling was 41,000 ft (12,500 m), and an altitude of 30,000 ft (9,000 m) could be attained in 14.6 minutes. The service life of the P-61C was quite brief, since it was being quickly outclassed by jet aircraft. Most were used for test and research purposes. By the end of March 1949, most P-61Cs had been scrapped. Two entered the civilian market and two others went to museums. In mid-1945, the surviving XP-61E was modified into an unarmed photographic reconnaissance aircraft. All the guns were removed, and a new nose was fitted, capable of holding an assortment of aerial cameras. The aircraft, redesignated XF-15, flew for the first time on 3 July 1945. A P-61C-1-NO (serial number 42-8335) was also modified to XF-15 standards. Apart from the turbosupercharged R-2800-C engines, it was identical to the XF-15 and flew for the first time on 17 October 1945. The nose for the F-15A-1-NO was subcontracted to the Hughes Tool Company of Culver City, California. The F-15A was basically the P-61C with the new bubble-canopy fuselage and the camera-carrying nose, but without the fighter brakes on the wing. The United States Marine Corps had planned to acquire 75 Black Widows, but these were canceled in 1944 in favor of the F7F Tigercat. In September 1945, however, the Marines received a dozen surplus P-61B-10 / 15 / 20 to serve as radar trainers until the F7F-3Ns would be available in squadron strength. Designated F2T-1N and given the build numbers 52750–52761, these aircraft were assigned to shore-based Marine units and served briefly – the last 2 F2T-1s being stricken on 30 August 1947. The P-61 featured a crew of three: pilot, gunner, and radar operator. It was armed with four 20 mm (.79 in) Hispano M2 forward firing cannons mounted in the lower fuselage, and four .50 in (12.7 mm) M2 Browning machine guns lined up horizontally with the two middle guns slightly offset upwards in a remotely-aimed dorsally mounted turret. The turret was driven by the General Electric GE2CFR12A3 gyroscopic fire control computer, and could be directed by either the gunner or radar operator, who both had the aiming control and gyroscopic collimator sight assembly posts attached to their swiveling seats. Main landing gear bays were located at the bottom of each nacelle, directly behind the engine. The two main gear legs were each offset significantly towards outboard in their nacelles, and retracted towards the tail; oleo scissors faced forwards. Each main wheel was inboard of its gear leg and oleo. Main gear doors were two pieces, split evenly, longitudinally, hinged at inner door's inboard edge and the outer door's outboard edge. Each engine cowling and nacelle drew back into tail booms that terminated upwards in large vertical stabilizers and their component rudders, each of a shape similar to a rounded right triangle. The leading edge of each vertical stabilizer was faired smoothly from the surface of the tail boom upwards, swept back to 37°. The horizontal stabilizer extended between the inner surfaces of the two vertical stabilizers, and was approximately ¾ the chord of the wing root, including the elevator. The elevator spanned approximately ? of the horizontal stabilizer's width, and in overhead plan view, angled inwards in the horizontal from both corners of leading edge towards the trailing edge approximately 15°, forming the elevator into a wide, short trapezoid. The horizontal stabilizer and elevator assembly possessed a slight airfoil cross-section. The engines and nacelles were outboard of the wing root and a short "shoulder" section of the wing that possessed a 4° dihedral, and were followed by the remainder of the wing which had a dihedral of 2°. The leading edge of the wing was straight and perpendicular to the aircraft's centerline. The trailing edge was straight and parallel to the leading edge in the shoulder, and tapered forward 15° outboard of the nacelle. Leading edge updraft carburetor intakes were present on the wing shoulder and the root of the outer wing, with a few inches of separation from the engine nacelle itself. They were very similar in appearance to those on the F4U Corsair — thin horizontal rectangles with the ends rounded out to nearly a half-circle, with multiple vertical vanes inside to direct the airstream properly. The P-61 did not have ailerons. Aside from the full-span retractable "Zap flaps," all control of the aircraft about the roll axis was maintained through the use of curved, tapered spoilerons, of approximately 10 ft (3 m) in length and 6 in (15 cm) in width (in overhead plan view) each. They were located outboard of the outer edge of each nacelle in overhead plan view, approximately ¼ the length of the outer wing panel (the wing panel beyond the engine nacelle's outboard surface, out to the wingtip) and offset towards the wing leading edge approximately one third the wing's chord from the trailing edge, running towards the wing-tip approximately half the length of the outer wing. Operation was as follows: the spoileron in the inside wing rotated out of the wing's upper surface into the airstream, disrupting the effect of Bernoulli's principle and reducing lift over that wing, causing it to drop. The main fuselage, or gondola, was centered on the aircraft's centerline. It was, from the tip of the nose to the end of the Plexiglas tail-cone, approximately five-sixths the length of one wing (root to tip). The nose housed an evolved form of the SCR-268 Signal Corps Radar, the Western Electric Company's SCR-720A. Immediately behind the radar was the forward crew compartment, seating the pilot and behind him the gunner, the latter elevated approximately 6 in (15 cm). The multi-framed "greenhouse" canopy featured two distinct levels, one for the pilot and a second for the gunner above and behind him. Combined with the nearly flat upper surface of the aircraft's nose, the two-tiered canopy gave the aircraft's nose a distinct appearance of three wide, shallow steps. The forward canopy in the XP-61 featured contiguous, smooth-curved, blown-Plexiglas canopy sections facing forward, in front of the pilot and the gunner. The tops and sides were framed. The center of the gondola housed the main wing spar, fuel storage, fuel piping and control mechanisms, control surface cable sections, propeller and engine controls, and radio/IFF (Identification Friend or Foe) /communications equipment, but was predominantly occupied by the top turret mounting ring, rotation and elevation mechanisms, ammunition storage for the turret's machine guns, the GE2CFR12A3 gyroscopic fire control computer, and linkages to the gunner and radar operator's turret control columns, forward and aft, respectively. The radar operator's station was at the aft end of the gondola. The radar operator controlled the SRC-720 radar set and viewed its display scopes from the isolated rear compartment, which he entered by way of a small hatch with a built-in ladder on the underside of the aircraft. In addition to the radar systems themselves, the radar operator had intercom and radio controls, as well as the controls and sight for the remote turret. The compartment's canopy followed the curvature of the gondola's rear section, with only a single rounded step to the forwards canopy's double step. The rear of the gondola was enclosed by a blown Plexiglas cap that tapered quickly in overhead plan view to a barely-rounded point; the shape was somewhat taller in side profile than it was in overhead plan view, giving the end of the "cone" a rounded "blade" appearance when viewed in perspective. The cross-section of the gondola, front to back, was generally rectangular, vertically oriented. The tip of the nose was very rounded, merging quickly to a rectangular cross-section that tapered slightly towards the bottom. This cross-section lost its taper but became clearly rounded at the bottom moving back through the forward crew compartment and nose gear well. Height increased at both steps in the forward canopy, with the second step being flush with the top of the aircraft (not counting the spinal gun turret). At the rear of the forward crew compartment, the cross-section's bottom bulged downwards considerably and continued to do so until just past the midpoint between the rear of the forward crew compartment and the front of the rear crew compartment, where the lower curvature began to recede. Beginning at the front of the rear crew compartment, the top of the cross-section began to taper increasingly inwards above the aircraft's center of gravity when progressing towards the rear of the gondola. The cross-section rounded out considerably by the downward step in the rear canopy, and rapidly became a straight-sided oval, shrinking and terminating in the tip of the blown-Plexiglas "cone" described above. Wing tips, wing-to-nacelle joints, tips and edge of stabilizers and control surfaces (excluding the horizontal stabilizer and elevator) were all smoothly rounded, blended or filleted. The overall design was exceptionally clean and fluid as the aircraft possessed very few sharp corners or edges. The production model of the SCR-720A mounted a scanning radio transmitter in the aircraft nose; in Airborne Intercept mode, it had a range of nearly five miles. The unit could also function as an airborne beacon / homing device, navigational aid, or in concert with interrogator-responder IFF units. The XP-61's radar operator located targets on his scope and steered the unit to track them, vectoring and steering the pilot to the radar target via oral instruction and correction. Once within range, the pilot used a smaller scope integrated into the main instrument panel to track and close on the target. The XP-61's spine-mounted dorsal remote turret could be aimed and fired by any one of the three-man crew, or could be locked forward to be fired by the pilot in addition to the 20 mm (.79 in) cannons. The radar operator could rotate the turret to face to the rear, in order to engage targets behind the aircraft. Capable of a full 360° rotation and 90° elevation, the turret could conceivably be used to engage any target in the entire hemisphere above and to the sides of the XP-61. The turret had buffeting problems on the airframe and was not installed for a few production runs. The first unit to receive production aircraft was the 348th Night Fighter Squadron in Florida which was responsible for training night fighter crews. The 422nd Night Fighter Squadron was the first to complete their training in Florida and, in February 1944, the squadron was shipped to England aboard the Mauritania. The 425th NFS was soon to follow aboard the Queen Elizabeth. The situation deteriorated in May 1944 when the squadrons learned that several USAAF generals believed the P-61 was too slow to effectively engage in combat with German fighters and medium bombers. General Spaatz requested de Havilland Mosquito night fighters to equip 2 US night fighter squadrons based in the UK. The request was denied due to insufficient supplies of Mosquitoes which were in demand for a number of roles. Several pilots in the 422nd NFS threatened to turn in their wings if they were not permitted to fly the Black Widow. At the end of May, the USAAF insisted on a competition between the Mosquito and the P-61 for operation in the European Theater. RAF crews flew the Mosquito Mk XVII while crews from the 422nd NFS flew the P-61. In the end the USAAF determined that the P-61 had a slightly better rate of climb, and could turn tighter than the Mosquito.Colonel Winston Kratz, director of night fighter training in the USAAF, had organised a similar competition earlier. He said of the results "I'm absolutely sure to this day that the British were lying like troopers. I honestly believe the P-61 was not as fast as the Mosquito, which the British needed because by that time it was the one airplane that could get into Berlin and back without getting shot down. I doubt very seriously that the others knew better. But come what may, the '61 was a good night fighter. In the combat game you've got to be pretty realistic about these things. The P-61 was not a superior night fighter. It was not a poor night fighter. It was a good night fighter. It did not have enough speed".. In England, the 422nd NFS finally received their first P-61s in late June, and began flying operational missions over England in mid-July. These aircraft arrived without the dorsal turrets so the squadron's gunners were reassigned to another NFS that was to continue flying the P-70. The first P-61 engagement in the European Theater occurred on July 15 when a P-61 piloted by Lt. Herman Ernst was directed to intercept a V-1 "Buzz Bomb." Diving from above and behind to match the V-1's 350 mph (560 km/h) speed, the P-61's plastic rear cone imploded under the pressure and the attack was aborted. The tail cones would fail on several early P-61A models before this problem was corrected. On 16 July, Lt. Ernst was again directed to attack a V-1 and, this time, was successful, giving the 422nd NFS and the European Theater its first P-61 kill. In early August 1944, the 422nd NFS transferred to Maupertus, France, and began meeting piloted German aircraft for the first time. A Bf 110 was shot down, and shortly afterwards, the squadron's commanding officer Lieutenant Colonel O. B. Johnson, his P-61 already damaged by anti aircraft land fire, shot down a Fw 190. The 425th NFS scored its first kill shortly afterwards. In October 1944, a P-61 of the 422nd NFS, now operating out of an abandoned Luftwaffe airfield in Florennes, Belgium, encountered a Messerschmitt Me 163 attempting to land. The P-61 tried to intercept it but the rocket powered aircraft was traveling too fast. A week later, another P-61 spotted a Me 262, but was also unable to intercept the jet. On yet another occasion, a 422nd P-61 spotted a Me 410 Hornisse flying at tree top level but, as they dove on it, the "Hornet" sped away and the P-61 was unable to catch it. Contrary to popular stories, no P-61 ever engaged in combat with a German jet or any of the late war advanced Luftwaffe aircraft. The most commonly encountered and destroyed Luftwaffe aircraft types were Junkers Ju 188s, Ju52s, Bf 110s, Fw 190s, Dornier Do 217s and Heinkel He 111s, while P-61 losses were limited to numerous landing accidents, bad weather, friendly and anti aircraft land fire. Apart from exploding V-1s and an attack on a Bf 110 Night Fighter that turned against them, there were no reports of a P-61 being damaged by a German aircraft; and apart from one accidentally shot down by an RAF Mosquito, none were confirmed to be destroyed in aerial combat. The absence of turrets and gunners in most European Theater P-61s presented several unique challenges. The 422nd NFS kept its radar operator in the rear compartment, meaning the pilot had no visual contact with the R/O. As a result, several courageous pilots continued flying their critically damaged P-61s under the mistaken belief that their R/O was injured and unconscious, when in fact the R/O had already bailed out. The 425th NFS had a more novel solution: they moved the R/O to the former gunner's position behind the pilot. This gave the pilot an extra set of eyes up front, and moved the aircraft's center of gravity about 15 in (38 cm) forward, changing the flight characteristics from slightly nose up to slightly nose down which also improved the P-61's overall performance. By December 1944, P-61s of the 422nd and 425th NFS were helping to repel the German offensive known as the Battle of the Bulge, with two flying cover over the town of Bastogne. Pilots of the 422nd and 425th NFS switched their tactics from night fighting to daylight ground attack, strafing German supply lines and railroads. The P-61's four 20 mm (.79 in) cannons proved highly effective in destroying large numbers of German locomotives and trucks. By early 1945, German aircraft were rarely seen and most P-61 night kills were Ju 52s attempting to evacuate Nazi officers under the cover of darkness. The 422nd NFS produced three ace pilots, while the 425th NFS officially claimed none. Lt. Cletus "Tommy" Ormsby of the 425th NFS was officially credited with three victories. Ormsby was killed by friendly fire moments after attacking two Ju 87s on the night of 24 March 1945. His radar operator escaped with serious injuries, and was saved only by the quick actions of German surgeons. He later reported that they had successfully engaged and shot down both Ju 87s before being shot down themselves. This claim was corroborated by other 425th aircrew who were operating in the area at the time. To this day, many members of the 425th question why Lt. Ormsby was never credited with his final two kills, and "ace" status. In the Mediterranean Theater, most night fighter squadrons transitioned from their aging Bristol Beaufighters into P-61s too late to achieve any kills in the "Black Widow." P-61's of the CBI Theater were responsible for patrolling a larger area than any night-fighter squadrons of the war. Unfortunately, the P-61 arrived too late in the CBI Theater to have any significant impact, as most Japanese aircraft had already been transferred out of the CBI Theater by that time in order to participate in the defense of the Japanese Homeland. The 6th NFS based on Guadalcanal received their first P-61s in early June, 1944. The aircraft were quickly assembled and underwent flight testing as the pilots transitioned from the squadron's aging P-70s. The first operational P-61 mission occurred on 25 June, and the type scored its first kill on 30 June 1944 when a Japanese Mitsubishi G4M "Betty" bomber was shot down. Throughout the summer of 1944, P-61s operating in the Pacific Theater would see sporadic action against Japanese aircraft. Most missions ended with no enemy aircraft sighted, but when the enemy was detected they were often in groups, with the attack resulting in multiple kills for that pilot and radar operator, who would jointly receive credit for the kill. On 30 January 1945, a lone P-61 performed a vital mission that was instrumental in the successful effort of the U.S. Rangers to free over 500 Allied POWs held by the Japanese at the Cabanatuan prison camp in the Philippines. As the Rangers crept up on the camp, a P-61 swooped low and performed aerobatic maneuvers for several minutes. The distraction of the guards allowed the Rangers to position themselves, undetected, within striking range of the camp. 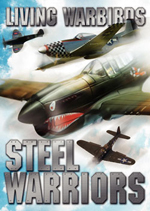 The story of the rescue and the role of the P-61 is told in the book Ghost Soldiers (by Hampton Sides) and in The Great Raid, a movie based upon the book, though the absence of a flying P-61 forced the filmmakers to feature a Lockheed Hudson in the film in its place. It is widely believed  that the last enemy aircraft destroyed before the Japanese surrender was downed by a P-61B-2 named "Lady in the Dark" (s/n 42-39408) of the 548th NFS. The aircraft was piloted by Lt. Robert W. Clyde and R/O Lt. Bruce K. LeFord on 14 August/15 August 1945 claiming a Nakajima Ki-44 "Tojo." It should be noted, though, that the destruction of the "Tojo" came without a shot being fired. After the pilot of the "Tojo" sighted the attacking P-61, he descended to wave-top level and began a series of evasive maneuvers which ended with his aircraft striking the water and exploding. Lts. Clyde and LeFord were never officially credited with this possible final kill of the war. Since pilots and radar operators did not always fly as a team, the kills of the pilot and radar operator were often different. On some occasions, a pilot or radar operator with only one or two kills would fly with a pilot or radar operator who was already an "ace." 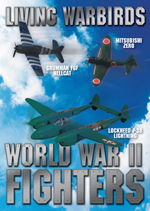 Though the P-61 proved itself very capable against the majority of German aircraft it encountered, it was clearly outclassed by the new aircraft arriving in the last months of World War II. It also lacked external fuel tanks until the last months of the war, an addition that would have extended its range and saved many doomed crews looking for a landing site in darkness and bad weather. External bomb loads would also have made the type more adaptable to the ground attack role it soon took on in Europe. These problems were all addressed eventually, but too late to have the impact they might have had earlier in the war. The P-61 proved very capable against all Japanese aircraft it encountered, but saw too few of them to make a significant difference in the Pacific war effort. The useful life of the Black Widow was extended for a few years into the immediate postwar period due to the USAAF's problems in developing a useful jet-powered night/all-weather fighter. The Curtiss P-87 had initially been scheduled as the jet-powered replacement for the Black Widow, but the failure of the XP-87 project meant the Black Widow had to soldier on for another few years. Replacement of the Black Widow by F-82F/G Twin Mustang night fighters began in early 1948, and by early 1950, most Black Widows were out of operational service. The last operational Black Widow left Japan in May 1950, missing the Korean War by only a month, while the last operational F-61 was retired in 1952. A Black Widow participated in early American ejection seat experiments performed shortly after the war. The Germans had pioneered the development of ejection seats early in the war, the first-ever emergency use of an ejection seat having been made on 14 January 1942 by a Luftwaffe test pilot when he escaped from a disabled Heinkel He 280 V1. American interest in ejection seats during the war was largely a side-issue of the developmental work done on pusher aircraft such as the Vultee XP-54, the goal being to give the pilot at least some slim chance of clearing the tail assembly and the propeller of the aircraft in the case of an emergency escape, but little progress had been made since pusher aircraft development had never really gotten past the drawing board or the initial prototype stage. 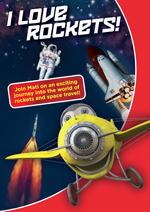 However, the development of high-speed jet-powered aircraft made the development of practical ejection seats mandatory. The P-61 was heavily involved in the Thunderstorm Project (1946–1949) that was a landmark program dedicated to gathering data on thunderstorm activity. The project was a cooperative undertaking on the part of four U.S. government agencies: the U.S. Weather Bureau and the NACA (National Advisory Committee for Aeronautics, later to become NASA), assisted by the U.S. Army Air Forces and Navy. Scientists from several universities also participated in the initiation, design, and conduct of the project. The project's goal was to learn more about thunderstorms and to use this knowledge to better protect civil and military airplanes that operated in their vicinity. The P-61's radar and particular flight characteristics enabled it to find and penetrate the most turbulent regions of a storm, and return crew and instruments intact for detailed study. P-61B-1NO serial number 42-39458 was operated by the Navy at the Patuxent River test facility in Maryland in a number of tests. P-61A-10NO serial number 42-39395 was subjected by the Navy to a series of test catapult launches to qualify the aircraft for shipboard launches, but the Black Widow was never flown from an aircraft carrier. These aircraft did not receive the naval designation F2T-1 but continued on as P-61. Shortly after the war, the Navy borrowed two P-61Cs (43-8336 and 43-8347) from the USAAF and used them for air-launches of the experimental Martin PTV-N-2U Gorgon IV ramjet-powered missile, the first launch taking place on 14 November 1947. While carrying a Gorgon under each wing, the P-61C would go into a slight dive during launch to reach the speed necessary for ramjet operation to be initiated. These two naval Black Widows were returned to the USAF in 1948, and transferred to the boneyard shortly afterwards. Surviving aircraft were offered to civilian governmental agencies, or declared surplus and offered for sale on the commercial market. An RF-61C (ex-F-15A, serial number 45-59300) was used by NACA at Moffett Field in California to test some early swept-wing designs by dropping recoverable aerodynamic test bodies from high altitude. This program was later joined by F-61C serial number 43-8330, borrowed from the Smithsonian Institution for the duration of the tests. These drops were carried out over Edwards Air Force Base in the Mojave Desert in California. F-61B-15NO serial number 42-39754 was used by NACA's Lewis Flight Propulsion Laboratory in Cleveland, Ohio for tests of airfoil-type ramjets. F-61C-1NO 43-8357 was used at Ames as a source for spare parts for other F/RF-61 aircraft. A few other Black Widows also ended up in the civilian market. P-61B-1NO serial number 42-39419 had been bailed to Northrop during most of its military career, who then bought the aircraft from the government at the end of the war. Having the civilian registration number NX30020 assigned to it, it was used as an executive transport, as a flight-test chase plane, and for tests with advanced navigational equipment. Later it was purchased by the Jack Ammann Photogrammetric Engineers, a photo-mapping company based in Texas; then in 1963, it was sold to an aerial tanker company and used for fighting forest fires. However, it crashed while fighting a fire on 23 August 1963, killing its pilot. The last flying example of the P-61 line was a rare F-15A Reporter (RF-61C) (s/n 45-59300), the first production model Reporter to be built. The aircraft was completed on 15 May, 1946, and served with the Army Air Corps and later the U.S. Air Force until 6 February 1948, when it was reassigned to the Ames Aeronautical Laboratory at Moffett Field in California. There it was reconfigured to serve as a launch vehicle for air dropped scale models of experimental aircraft. It served in this capacity until 1953, when it was replaced by a mammoth wind tunnel used for the same testing. In April 1955, the F-15 was declared surplus along with a "spare parts" F-61C (s/n 43-8357). The F-15 was sold, along with the parts P-61, to Steward-Davis Incorporated of Gardena, California, and given the civilian registration N5093V. Unable to sell it, the P-61C was scrapped in 1957. Steward-Davis made several modifications to the Reporter to make it suitable for aerial survey work, including switching to a canopy taken from a T-33, and to propellers taken from an older P-61. The aircraft was sold in September, 1956 to Compania Mexicana Aerofoto S. A. of Mexico City and assigned the Mexican registration XB-FUJ. In Mexico, the Reporter was used for aerial survey work, the very role for which it was originally designed. It was bought by Aero Enterprises Inc. of Willets, California and returned to the USA in January 1964 carrying the civilian registration number N9768Z. The fuselage tank and turbosupercharger intercoolers were removed; and the aircraft was fitted with a 1,600 gal (6,056 l) chemical tank for fire-fighting. It was purchased by Cal-Nat of Fresno, California at the end of 1964, which operated it as a firefighting aircraft for the next 3½ years. In March 1968, the F-15 was purchased by TBM, Inc., an aerial firefighting company located in Tulare, California (the name of the company standing for the TBM Avenger, the company's primary equipment), who performed additional modifications on the aircraft to improve its performance, including experimenting with several types of propellers before deciding on Curtiss Electric type 34 propellers taken from a late model Lockheed Constellation. On 6 September 1968, Ralph Ponte, one of three civilian pilots to hold a rating for the F-15, was flying a series of routine Phoscheck drops on a fire raging near Hollister, California. In an effort to reduce his return time, Ponte opted to reload at a small airfield nearer the fire. The runway was shorter than the one in Fresno, and despite reducing his load, hot air from the nearby fire reduced the surrounding air pressure and rendered the aircraft overweight. Even at full power the Reporter had not rotated after clearing the 3,500 ft (1,067 m) marker, and Ponte quickly decided to abort his takeoff. Every effort was made to control the hurtling craft, but the Reporter careened off the runway and through a vegetable patch, before striking an embankment which tore off the landing gear. The aircraft then slid sideways, broke up and caught fire. Ponte scrambled through the shattered canopy unhurt, while a firefighting Avenger dropped its load of Phoscheck on the aircraft's two engines, possibly saving Ponte's life. The F-15, though intact, was deemed too badly damaged to rebuild, and was soon scrapped, bringing an end to the career of one of Northrop's most successful designs. XP-61 - The first two prototypes. YP-61 - Pre-production series; 13 built. P-61A-1 - First production version, R-2800-10 engines producing 2,000 hp (1,491 kW); 45 built, the last seven without the turret. 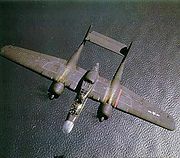 P-61A-5 - No turret, R-2800-65 engines producing 2,250 hp (1,678 kW); 35 built. P-61A-10 - Water injection to increase duration of maximum power output; 100 built. P-61A-11 - One hardpoint under each wing for bombs or fuel tanks; 20 built. P-61B-1 - Nose stretched 8 in (20 cm), SCR-695 tail warning radar; 62 built. P-61B-2 - Reinstated underwing hardpoints as on P-61A-11; 38 built. P-61B-10 - Four underwing hardpoints; 46 built. P-61B-11 - Reinstated turret with two 0.50 in (12.7 mm) machine guns; five built. P-61B-15 - Turret with four 0.50 in (12.7 mm) machine guns; 153 built. P-61B-16 - Turret armament reduced to two machine guns; six built. P-61B-20 - New General Electric turret with four machine guns; 84 built. P-61B-25 - Turret automatically aimed and fired by the APG-1 gun-laying radar connected to an analogue computer; six built. P-61C - Turbosupercharged R-2800-73 engines producing 2,800 hp (2,088 kW), top speed increased to 430 mph (374 kn, 692 km/h) at 30,000 ft (9,145 m). However, the aircraft suffered from longitudinal instability at weights above 35,000 lb (15,875 kg) and from excessive takeoff runs — up to 3 mi (5 km) at a 40,000 lb (18,143 kg) takeoff weight; 41 built, 476 more cancelled after the end of the war. TP-61C - P-61Cs converted to dual-control training aircraft. XP-61D - One P-61A-5 (number 42-5559) and one P-61A-10 (number 42-5587) fitted with turbosupercharged R-2800-14 engines; cancelled when P-61C entered production. XP-61F - Abandoned conversion of one P-61C to XP-61E standard. P-61G - Sixteen P-61B converted for meteorological research. F-15A Reporter - Photoreconnaissance variant with a new center pod with pilot and camera operator seated in tandem under a single bubble canopy, and six cameras taking place of radar in the nose. Powered by the same turbosupercharged R-2800-73 engines as the P-61C. The first prototype XF-15 was converted from the first XP-61E prototype, the second XF-15A was converted from a P-61C (number 43-8335). The aircraft had a takeoff weight of 32,145 lb (14,580 kg) and a top speed of 440 mph (382 kn, 708 km/h). Only 36 of the 175 ordered F-15As were built before the end of the war. After formation of the United States Air Force in 1947, F-15A was redesignated RF-61C. F-15As were responsible for most of the aerial maps of North Korea used at the start of the Korean War. - 418th Night Fighter Squadron (1943–1947). Operated in New Guinea, Philippines, Okinawa. After inactivation personnel, equipment and aircraft assigned to 4th Fighter Squadron (All Weather). - 421st Night Fighter Squadron (1943–1947). Operated in New Guinea, Philippines, Okinawa. After inactivation personnel, equipment and aircraft assigned to 68th Fighter Squadron (All Weather). - 547th Night Fighter Squadron (1944–1945). Operated in New Guinea, Philippines, Okinawa. - 6th Night Fighter Squadron (Formerly 6th Pursuit Squadron) (1942–1947). Operated in Hawaii, Guadacanal, New Guinea, Iwo Jima. After inactivation, personnel, equipment and aircraft assigned to 339th Fighter Squadron (All Weather). - 548th Night Fighter Squadron (1944-1945). Operated in Saipan, Iwo Jima, Okinawa. - 549th Night Fighter Squadron (1944-1946). Operated in Saipan, Iwo Jima, Okinawa. - 419th Night Fighter Squadron (1943-1947). Operated in New Guinea, Philippines. - 550th Night Fighter Squadron (1944-1946). Operated in New Guinea, Philippines. - 422d Night Fighter Squadron (1943-1945). Operated in England, France, Belgium, Germany. - 425th Night Fighter Squadron (1943–1947). Operated in England, France, Germany. - 414th Night Fighter Squadron (1943–1947). Operated in Algeria, Sardinia, Corsica, Italy, plus detachment to Belgium. Reassigned to Shaw AAF, South Carolina, 15 August 1946 and inactivated 16 March 1947. Personnel and aircraft were reassigned to the 319th Fighter Squadron (All Weather) and flown to Rio Hato AB, Panama. - 415th Night Fighter Squadron (1943–1947). Operated in Algeria, Italy, Corsica, France, Germany. Reassigned to Shaw AAF, South Carolina, 13 July 1946 and reassigned to Alaskan Air Command, 19 May 1947. Inactivated on 1 September 1947, personnel and aircraft assigned to Alaskan Air Command 449th Fighter Squadron (All Weather). - 416th Night Fighter Squadron (1943–1946). Operated in Italy, Corsica, France, Germany. Inactivated 9 November 1946 and personnel, equipment and aircraft assigned to 2d Fighter Squadron (All Weather). - 417th Night Fighter Squadron (1943–1946). Operated in England, Algeria, Tunisia, Corsica, France, Germany. Inactivated 9 November 1946 and personnel, equipment and aircraft assigned to 5th Fighter Squadron (All Weather). - 427th Night Fighter Squadron (1944). Operated briefly in Italy. Programmed for assignment to Poltava, Ukraine on the Eastern Front, instead reassigned to Tenth Air Force in China-Burma-India Theater. - 426th Night Fighter Squadron (1944-1945). Operated from India (10th AF), and China (14th AF). - 427th Night Fighter Squadron (1944-1945). Reassigned from Twelfth Air Force in Italy. Operated from India and Burma (10th AF), and China (14th AF). 348th Night Fighter Squadron (1943–1944). Operated from Orlando AAB, Florida (1943); Salinas AAB, California (1944). - 2d Fighter Squadron (All Weather). Formed from equipment and personnel of 416th Night Fighter Squadron in November 1946 at Schweinfurt, Germany. Assigned to 52d Fighter Group (All Weather). Reassigned to Mitchel AAF, New York in June 1947. Transitioned to F-82 Twin Mustang at McGuire AFB, New Jersey in October 1949. - 5th Fighter Squadron (All Weather). Formed from equipment and personnel of 417th Night Fighter Squadron in November 1946 at Schweinfurt, Germany. Assigned to 52d Fighter Group (All Weather). Reassigned to Mitchel AAF, New York in June 1947. Transitioned to F-82 Twin Mustang at McGuire AFB, New Jersey in October 1949. - 317th Fighter Squadron (All Weather). Assigned to 325th Fighter Group (All Weather) at Mitchel AAF, New York in May 1947 and assigned P-61s. Reassigned to Hamilton AAF, California in November 1947. Reassigned to Moses Lake AFB, Washington in November 1948 where it transitioned to F-82 Twin Mustangs. - 319th Fighter Squadron (All Weather). Formed from equipment and personnel of 414th Night Fighter Squadron. Ground echelon of unit formed at Rio Hato AB, Panama in March 1947; air echelon acquired P-61 aircraft at Shaw Field, South Carolina and flew them to Panama for air defense of the Panama Canal. Assigned to 6th Fighter Wing. Squadron was subsequently reassigned to France AFB, Canal Zone in January 1948. Transitioned to F-82 Twin Mustangs in December 1948. - 449th Fighter Squadron (All Weather). Formed from equipment and personnel of 415th Night Fighter Squadron at Adak Air Field, Aleutian Islands, Alaska on 1 September 1947. Later transitioned to F-82 Twin Mustang in December 1948. - 4th Fighter Squadron (All Weather). Formed from equipment and personnel of 418th Night Fighter Squadron in August 1948 at Naha Air Base, Okinawa. Assigned to 347th Fighter Group. Transitioned to F-82 Twin Mustang in September 1948. - 68th Fighter Squadron (All Weather). Formed from equipment and personnel of 421st Night Fighter Squadron in August 1948 at Bofu Air Base, Japan. Assigned to 8th Fighter-Bomber Wing. Transitioned to F-82 Twin Mustangs in February 1950. - 339th Fighter Squadron (All Weather). Formed from personnel and equipment of 6th Night Fighter Squadron in February 1947 at Johnson AB Japan.F-82 Twin Mustangs assigned in February 1950. Note: The 339th was the last USAF squadron equipped with F-61s, the last aircraft being sent to reclamation at Tachikawa AB in May 1950. - 57th Reconnaissance Squadron and 58th Reconnaissance Squadron. Performed Weather Reconnaissance training at Rapid City AAF, South Dakota (July 1945–Jan 1946). P-61B-1NO c/n 964 AAF Ser. No. 42-39445, which crashed on 10 January 1945 on Mount Cyclops in New Guinea, was recovered in 1991 by the Mid-Atlantic Air Museum of Reading, Pennsylvania. The aircraft has been undergoing a slow restoration since then with the intention of eventually returning it to flying condition, with the civilian registration N550NF. When finished, it is expected to be over 70% new construction. As of February 2008, the center pod is complete and the tail booms have been connected to the inner wings. The aircraft is expected to be towable on its landing gear as soon as the engines are installed to counterbalance the tail weight. P-61B-15NO c/n 1234 AAF Ser. No. 42-39715 is on outside display at the Beijing University of Aeronautics and Astronautics in China. The official story is that one of the P-61s that were based in Sichuan Province during the war was turned over to the Chendu Institute of Aeronautical Engineering in 1947. When the Institute moved to its present location, it did not take this aircraft with them, instead shipping it to the Beijing Institute of Aeronautical Engineering in 1954. However, as both USAAF night fighter squadrons (426th, 427th) that served in China were deactivated in 1945, this may not be accurate. 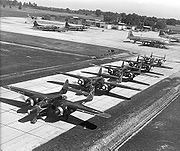 An alternative explanation is that at the end of hostilities in 1945, the 427th was in the process of bringing their various detachments back to a central airfield for disposition of the aircraft and to start processing home. At one of the satellite airfields, two of the three P-61s were in need of maintenance. Reportedly, Chinese communist troops came onto the field and ordered the Americans to leave without their aircraft. This aircraft is in very poor condition and probably near the point of structural collapse. The Chinese claim to have two additional P-61s in storage which they have offered for sale for $2,000,000. P-61C-1NO c/n 1376 AF Ser. No. 43-8330, belonging to the National Air and Space Museum (NASM), was delivered to the Army on 28 July 1945. By 18 October, this P-61 was flying at Ladd Field, in Alaska conducting cold weather tests, where it remained until 30 March 1946. The airplane was later moved to Pinecastle AAF in Florida for participation in the National Thunderstorm Project. Pinecastle AAF personnel removed the guns and turret from 43-8330 in July 1946 to make room for new equipment. In September the aircraft moved to Clinton County Army Air Base in Ohio, where it remained until January 1948. The Air Force then reassigned the aircraft to the Flight Test Division at Wright-Patterson Air Force Base in Dayton, Ohio. After being declared surplus in 1950 it was donated by the U.S. Air Force to the National Air Museum in Washington D.C. (it became the National Air & Space Museum in 1966). On 3 October it was transferred to Park Ridge, Illinois where it was stored along with other important aircraft destined for eventual display at the museum. The aircraft was moved temporarily to the museum's storage facility at Chicago's O'Hare International Airport, but before the museum could arrange to ferry the aircraft to Washington D.C. the National Advisory Committee for Aeronautics asked to borrow it. In a letter to museum director Paul E. Garber dated 30 November 1950, NACA director for research I.H. 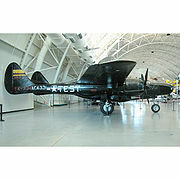 Abbott described his agency's "urgent" need for the P-61 to use as a high-altitude research craft. Garber agreed to an indefinite loan of the aircraft, and the Black Widow arrived at the Ames Aeronautical Laboratory, at Naval Air Station Moffett Field in California, on 14 February 1951. When NACA returned the aircraft to the Smithsonian in 1954 it had accumulated only 530 total flight hours. From 1951 to 1954 the Black Widow was flown on roughly 50 flights as a mothership, dropping recoverable swept-wing test bodies as part of a National Advisory Committee for Aeronautics program to test swept-wing aerodynamics. NACA test pilot Donovan Heinle made the aircraft's last flight when he ferried it from Moffett Field to Andrews Air Force Base, arriving on 10 August 1954. The aircraft was stored there for seven years before Smithsonian personnel trucked it to the museum's Garber storage facility in Suitland, Maryland. In January 2006 the P-61C was moved into Building 10 so that Garber's 19 restoration specialists, three conservationists and three shop volunteers could work exclusively on the aircraft for its unveiling at the Steven F. Udvar-Hazey Center on 8 June. The aircraft was restored to its configuration as a flight test craft for swept-wing aeronautics, so the armament and turret were not replaced. A group of former P-61 air crews were present at the aircraft's unveiling, including former Northrop test pilot John Myers. P-61C-1NO c/n 1399 AAF Ser. No. 43-8353 is currently on display at the National Museum of the United States Air Force in Dayton, Ohio. It is marked as P-61B-1NO 42-39468 and painted to represent "Moonlight Serenade" of the 550th Night Fighter Squadron. Donated to the museum in 1958 by the Tecumseh Chapter of the Boy Scouts of America in Springfield, Ohio, the aircraft recently had a reproduction turret installed, fabricated by the Museum's restoration team. 1. Knaack, M.S. Post-World War II Fighters, 1945-1973. Washington, DC: Office of Air Force History, 1988. ISBN 0-16-002147-2. 2. Wilson 1998, p. 142. 4. a b c Johnson 1976 pp. 30–44. 5. Davis and Menard 1990, p. 4. 6. Thompson 1999, p. 86. 7. Thompson 1999, p. 88. 8. Thompson 1971, pp. 44–50. 9. Sharp and Bowyer 1997, p. 379. 12. Thompson 1999, p. 95. 13. Thompson 1999, p. 89. 14. Pape, Garry R., and Harrison, Ronald C., "Dark Lady, Pt. II - The Further Adventures of Northrop's Flying Spider Ship...From P-61B Through P-61E", Airpower, Granada Hills, California, November 1976, Volume 6, Number 6, pp. 10–24. 15. Thompson 1999, pp. 84–85. Note: "Their photos of Korea were invaluable to the UN forces during the first few weeks of that war. It was not until the Marine photo version of the F7F Tigercat made its sweeps over Inchon that any additional pictures were taken." 19. P-61 Black Widow Retrieved: 19 March 2008. 24. Northrop P-61C Black Widow Smithsonian: National Air and Space Museum. Retrieved: 19 May 2008. 25. Tedeschi 2006, pp. 14–15. 28. Bridgeman 1946, pp. 251–252. 29. Musia?kowski, P.K. Nocny samolot my?liwski (Northrop P-61 Black Widow). Warszawa: Wydawnictwo Ministerstwa Oborony Narodowej, 1985. ISBN 0-831107-10-7. Sharp, C.M. and M.J.F. Bowyer. Mosquito. London: Crecy Publishing, 1997. 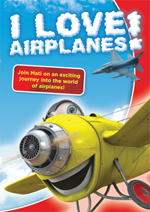 ISBN 978-0947554415.